The paint may be peeling, but this North Carolina roadside attraction is still a vibrant yellow, eye-catching just outside the historic district of Winston-Salem. Bars on the small, foggy windows and the forlorn “Closed” sign give this station an abandoned look — but it does open its doors during shortened business hours to allow people to tour its cramped interior. Inside, you’ll find a miniature museum about the station, full of old pictures and newspaper clippings. Old-timey pumps sit outside. The unusual shape is created by stucco, plastered around curved pieces of wood and wireframe. Built in the 1930’s along with seven other similar stations, its creative design is a memento of a simpler time. 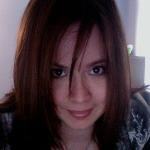 It’s emblematic of an era before TV advertisements, SEO and social media business strategies. 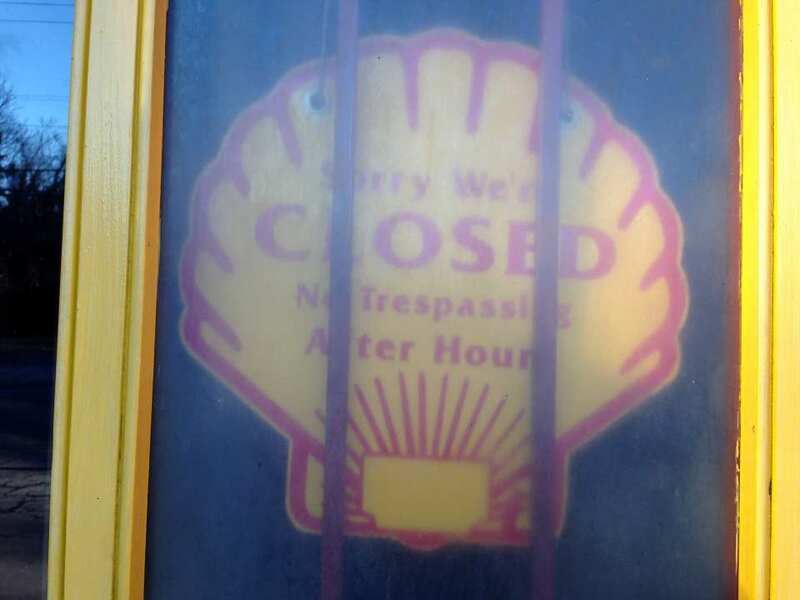 Shell didn’t have an Instagram account. To attract customers, this station’s marketing strategy was literally built on its physical foundation. Actually, this style of advertising was common in the 1930’s, 40’s, and 50’s. Call it good old-fashioned Americana. 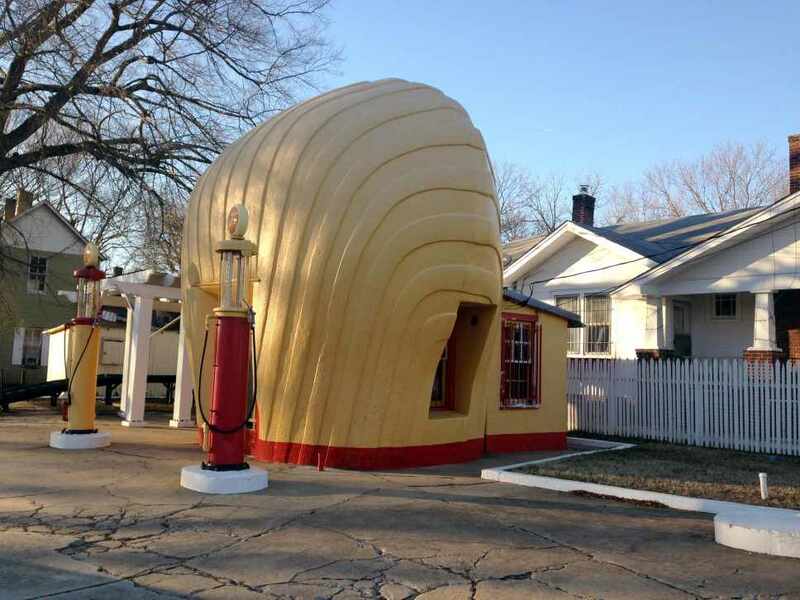 It’s in the same genre of strange architecture as the iconic and gigantic Mercury Cougar — who, we all know, is the pet kitty of the Roadside Muffler Men, including the infamous Raleigh Giant. There’s also a slurpee stand in Smithfield called Hills of Snow, where you are served syrupy, colorful frozen treats through the window of a monster-sized slurpee. 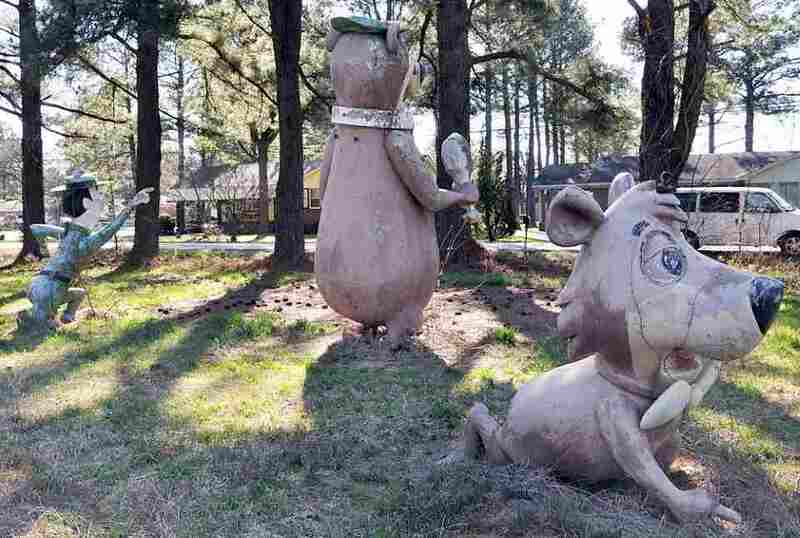 Rocky Mount has some creepy fiberglass statues of Yogi Bear, Boo-Boo, and Ranger Rick, which were used to attract kids to Yogi Bear’s Honey Fried Chicken. The statues look like living nightmares from Five Nights at Freddie’s — limbs are missing, eyeballs are faded; with frozen expressions they look like zombies, lumbering towards you. There’s even a Yogi Bear Graveyard, where the spare and broken parts are discarded. It’s beyond creepy. Then there’s also a Paul Bunyan and his Blue Ox in Battleboro, standing guard over a company that sells log cabins. Thank you, Strange Carolinas. You give us so much inspiration for cool places to explore in North Carolina. These stations, popular for their time period, became obsolete in the 1950’s, when the final station closed. The problem with the unusual and creative architecture is that it’s not very efficient. Its cramped quarters are obvious from the outside, with a bulbous front area creating the shell, and an unreasonably small boxed off back end for the office and restrooms. The station was eventually bought by a repair business, and finally sold to Preservation North Carolina. The first time I saw its picture, I drove two hours to Winston-Salem just to take a look. It enjoys a protected status, on the registry of historic places. 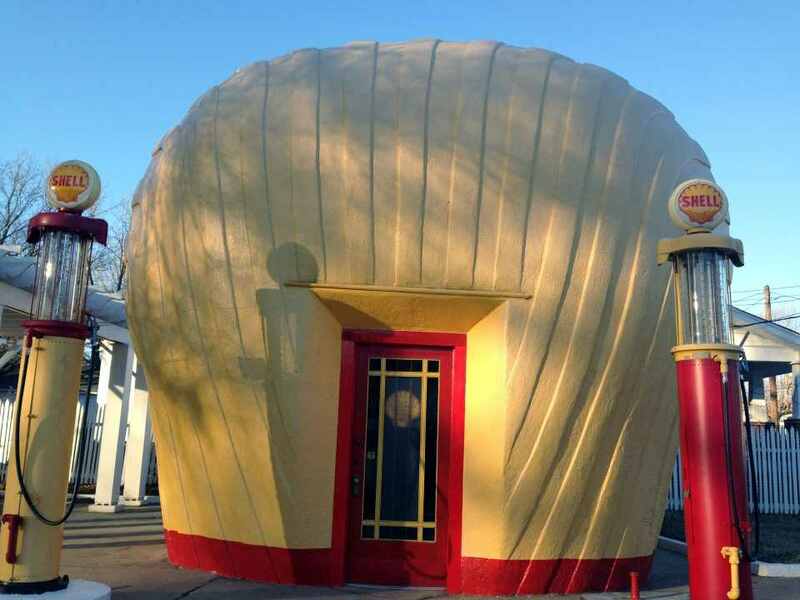 A little, yellow building on a dingy corner — a small monument to old-school branding, when Shell’s logo was literally built across the countryside of a simpler America. RELATED: Abandoned North Carolina: 7 Forgotten Historic Sites With Unique Stories. Be sure to get a Moravian cookie while you’re in town. Want to see the Shell Station in Winston-Salem? Location: Corner of the Peachtree St. and East Sprague St.